At Wanna’s Frankton engineering base – Paul Willard (left) and Jason Brand are guys who love coming to work. Raglan’s unique. For generations its been the Waikato’s beach town – a summertime mecca for Waikato and Auckland beachgoers. Once it had an image problem, but today its very mainstream. Its crowded in summer. On a Saturday you can wait in line 90 minutes for a hamburger. Its unspoilt and natural. The surf is sensational. According to “Lonely Planet” its New Zealand’s best-looking town. The population is an eclectic mix of international business people, hippies, and surfers. On the downside, there’s not a lot of employment, certainly so in the off season. And the residents aren’t in a hurry to accelerate development with some having famously threatened to leave if KFC ever comes to town. There isn’t much work in Raglan. Most people commute to Hamilton. Despite all that, Raglan has fibre-grade broadband before the cities even got it. Its got Wanna Internet to thank for that. Driving west from Wanna’s new premises in Frankton – a few metres from SH1 with oodles of room to expand – founder Jason Brand tells me how Wanna came about. Jason spent many years overseas. He’s an electronic engineer by profession but a telecommunications guy by choice. He worked in London, South Africa and Australia. His career culminated as Group Chief Technical Architect of global financial services giant Investec. But Jason had done his dash with big corporates and computers. Around 2011 he returned to his roots in Raglan. With nothing much to do over Christmas he set up a wireless hot spot. It actually made a small amount of money. So Jason upgraded Wanna from a dalliance to a serious business. He organised backhaul from Snap Internet on a standard home plan and bought some access points to service a handful of customers. “It cost me a heap in data over-runs,” he confessed. Then he stumbled across Go Wireless, the doyen of and equipment supplier to Kiwi WISPs. From there it was game on. Jason’s original goal was to WiFi-connect the whole of Raglan. He didn’t quite get there. But life moved on. The Snap bill got higher and higher as he connected multiple customers to what was essentially a single residential plan. So working with Waikato “Telco Guy” Shane Hobson he organised a professional backhaul deal through FX Networks, allowing him to sign up multiple customers in the far bigger market of Hamilton. At that time Chorus was realising it no longer had the benefit of a monopoly. Suddenly its backhaul pricing dropped by 90%. The backhaul floodgates opened. That made Wanna’s business model a whole lot more enticing. The company became nationwide but retained a Waikato focus. In no time they’d built a dozen wireless sites from Te Akau south to Kawhia and Whatawhata in the east. He’s been telling me all this as we wind our way west through undulating country towards the coast. 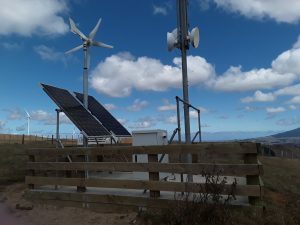 Now, we turn off the road and climb a steep farm track for 15 minutes to Wanna’s site at Mount Te Uku station, way up in the sky among the wind turbines. High on a hill overlooking Raglan and the west coast, Wanna’s Mount Te Uku Station site is as solid as they come. As WISP sites go this is special. Its powered by both solar panels and wind turbines. Solar is king but wind kicks in for a couple of weeks each year when the sun disappears. The pristine concrete slab looks as if its been vacuumed that morning – everything is immaculate. It’s a site that’s benefited from a decade of trial and error. The concrete pad makes life easy – its safe to work on, convenient, meets the OSH goals, and avoids the cattle damaging the fence by sticking their heads through to eat the grass. Wind turbines for the national grid in the background. This ridge is seriously breezy. 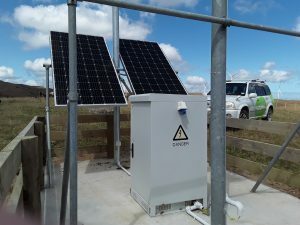 Nothing is spared to achieve a solid site – note the extensive bracing to offset the westerly gales, wind turbines used a couple of weeks each year to supplement the solar power, and flat concrete floor to make maintenance a breeze. Jason claims proudly a site like this should go a decade without serious maintenance. 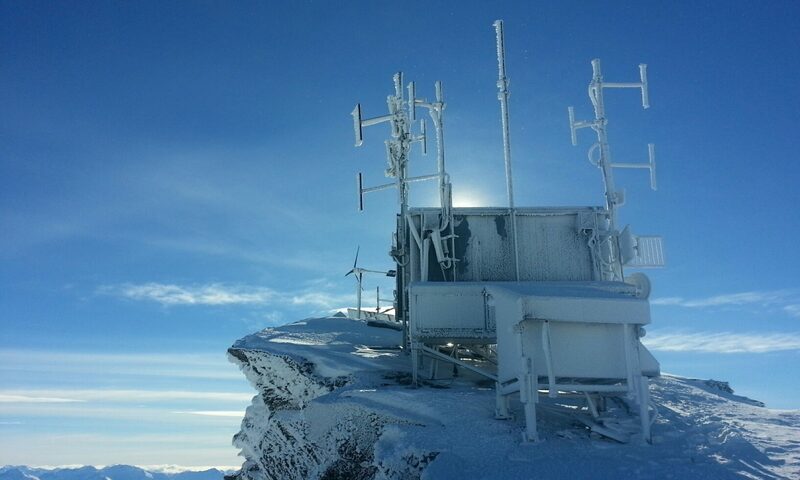 Every WISP’s area has individual climatic and topographical challenges. Wanna contends with wild westerly salt water gales which cause huge issues with rust. Powder coating helps resist this. They’ve seen wind turbines blown to pieces on a really bad day. It’s not just confined to WISP sites – Wanna Systems and Networks Manager Paul Willard tells me he has put special reinforced walls on the west side of his home so it won’t blow over. Issues with loose sand have seen the turbines literally blown off a site or two on bad days. Planting special grasses specific to the area helps to stabilise their equipment. Wanna’s coverage has grown greatly over time. 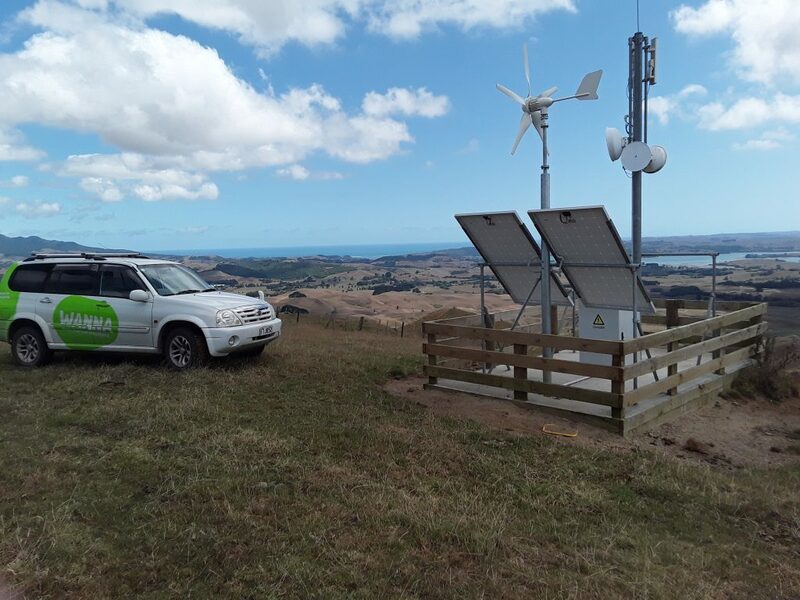 Today the network comprises over a dozen sites covering the coast from Te Akau (west of Taupiri) to Kawhia, and inland to the general area of Whatawhata. There’s constant expansion – a new site has just been commissioned at Aotea to strengthen the Kawhia footprint. All that’s taken Wanna’s customer count to around 1100 businesses and homes. If all else fails, there are batteries. Back at the Frankton base I get a chance to talk more to Paul Willard. By his own description a “classic nerd” Paul spent time as Global Operations Manager for SMX email and has been in large corporates for most of his career. He’s got the tech skills as well as business credentials honed by an MBA. As for the future, who knows in such an evolving industry? Fibre to the premises is increasingly intruding into Wanna’s core territory. New settlements targeted now have small clusters of customers – maybe 20 compared to the 3500 on offer in Raglan. New wireless technologies, especially LTE (Long Term Evolution) are imminent and offer huge new efficiencies preceded by a lot of capital investment. Not many customers describe their telecommunications service as “Absolutely exemplary” but that’s the description from Wanna customer Alex Crane. Alex is a Raglan-based security consultant whose needs are quite special, including penetration testing. 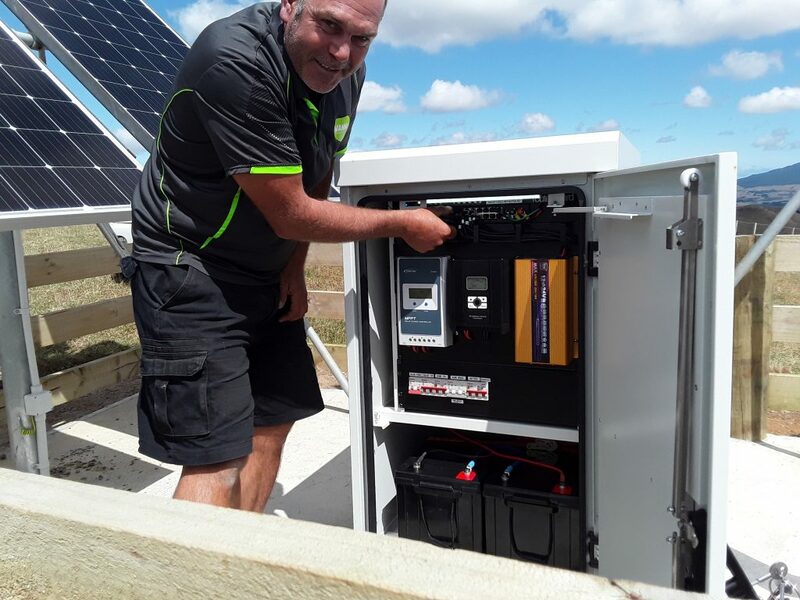 His 120 year-old copper line in a dead spot in Raglan was never going to meet his needs, and experiences with both Vodafone and Spark showed no interest in a customer whose needs didn’t fit their “cookie cutter” product. “Wanna’s billing and reminder services, their automation levels and personal service, are the best customer service I’ve ever experienced from an ISP,” says Alex. It doesn’t get much better than that. Across the opposite side of Wanna’s network I find another huge Wanna fan. Gordon Simmonds is the accountant at Crusader Meats on Highway 30, midway between Mangakino and Benneydale. With 170 staff Crusader is small by meat industry standards, but in Benneydale its massive. “We had nothing here for connectivity,” Gordon tells me. “The copper was unusable – it couldn’t even do Internet banking. We’d had a go ourselves at getting a wireless connection, but it was going down most days.